If you fly a piston-powered aircraft, you undoubtedly were taught to perform a "mag check" during the pre-takeoff runup. But do you know how to do it correctly, what to look for, and how to interpret the results? Surprisingly, many pilots don't. To begin with, most POHs instruct you to note the RPM drop when you switch from both mags to just one, and give some maximum acceptable drop. This archaic method makes little sense for aircraft that are equipped with a digital engine monitor (as most are these days), because EGT rise is a far better indicator of proper ignition performance than RPM drop. 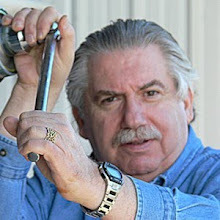 You should focus primarily on the engine monitor, not the tachometer, when performing the mag check. What you should be looking for is all EGT bars rising and none falling when you switch from both mags to one mag. The EGT rise will typically be 50 to 100 degrees F, but the exact amount of rise is not critical, and it's perfectly normal for the rise to be a bit different for odd- and even-numbered cylinders. You should also be looking for smooth engine operation and stable EGT values when operating on each magneto individually. A falling or erratic EGT bar or rough engine constitutes a "bad mag check" and warrants troubleshooting the ignition system before flying. The "mag check" is poorly named, because because the vast majority of "bad mag checks" are caused by spark plug problems, not magneto problems. (It's really an "ignition system check.") How can you tell if the culprit is the plugs or the mags? Simple: A faulty spark plug affects only one cylinder (and one EGT bar on your engine monitor), while a faulty magneto affects all cylinders (and all EGT bars). If you get an excessive RPM drop when you switch to one mag, but the EGTs all rise and the engine runs smooth, chances are that it's not a bad mag but rather retarded ignition timing. This is sometimes caused by mechanic error in timing the mags, but it can also be caused by excessive magneto cam follower wear (possibly due to inadequate cam lubrication) or some other internal mag problem. 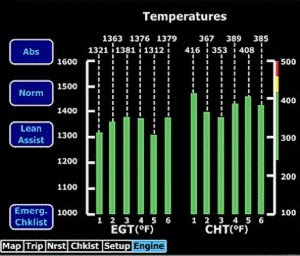 Retarded ignition timing also results in higher-than-usual EGT indications. Conversely, advanced ignition timing results in lower-than-usual EGT indications, and also higher-than-usual CHT indications. Advanced timing is a much more serious condition because it can lead to detonation, pre-ignition, and serious engine damage. If you observe low EGTs and high CHTs after an aircraft comes out of maintenance, do not fly until you've had the ignition timing re-checked. The usual pre-flight mag check is a relatively non-demanding test, and will only detect gross defects in the ignition system. To make sure your engine's ignition is in tip-top shape, we recommend performing an in-flight mag check at cruise power and a lean mixture (preferably a lean-of-peak mixture). 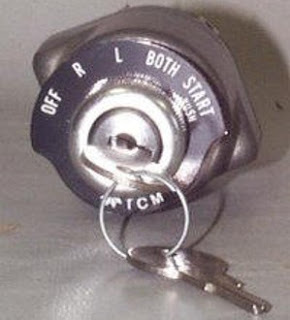 Because a lean mixture is much harder to ignite than a rich one, an in-flight LOP mag check is the most demanding and discriminating way to test your ignition system. It's a good idea to perform one every flight or two. The in-flight mag check is performed at normal cruise power and normal lean mixture (preferably LOP). Run the engine on each individual mag for at least 15 or 20 seconds. Ensure that all EGTs rise, that they are stable, and that the engine runs smoothly on each mag. If you see a falling or unstable EGT, write down which cylinder and which mag, so your mechanic or SAMM account manager will know which plug is the culprit.